DEC invites the public to comment about a proposed remedy to address contamination related to the Union Fork & Hoe Site (Frankfort, Herkimer Co.), within New York's State Superfund Program. Public comments about the proposal will be accepted through March 9, 2018. A public meeting also will be held about the proposal: February 27, 2018 at 7:00PM at the Frankfort Village Hall, 110 Railroad Street, Frankfort, NY 13340 (snow date is 2/28/18 at 7:00PM). Join us for an introduction to maple sugaring, from tap and sap to syrup. You’ll get to twirl a brace and bit drill, pound a spile, inspect the sap flow in our sugarbush, enjoy the aroma of sap boiling down in our evaporator and take the maple taste test. A local maple producer will be on site to answer questions and offer a variety of maple products for sale. Organized groups are welcome but are asked to call the Center at 518-475-0291 to register. DEC invites the public to comment about a draft plan to investigate contamination related to The Hugueonot Site (New Rochelle, Westchester Co.), within New York's Brownfield Cleanup Program. Public comments about the proposal will be accepted through March 12, 2018. Project documents can be reviewed at: New Rochelle Public Library, Attn: Larry Sheldon, One Library Plaza, New Rochelle, NY 10801; phone: 914-813-3749. Location: Glenville Town Hall, 18 Glenridge Road, Schenectady, NY 12302. The long-term health and productivity of New York's forests are threatened by pests and diseases. Come learn about oak wilt, a relatively new forest health concern to the Capital Region, and other invasive species threatening our trees. DEC pesticide credits are available, ISA and CNLP credits pending. Early registration is due by March 6th. ATTENTION: Meeting Cancelled due to school closure. To be rescheduled. DEC invites you to this public meeting which will outline plans for upcoming fisheries work on the Upper Delaware River system. The presentation will start promptly at 6 PM. Click on the web link above at "Additional Information" to review the plans for the upcoming fisheries work. Availability Session Location: Harrietstown Auditorium, 39 Main St., Saranac Lake, NY. DEC invites you to this discussion about cleanup activities about to begin at the Saranac Lake Gas Company Site (Saranac Lake, Essex Co.), within New York's State Superfund Program. Drop in any time during the session to ask questions and discuss the upcoming site activities. Click the web link above at "Additional Information" to learn about the site and the availability session. Project documents can be reviewed at: Saranac Lake Free Library, 100 Main Street, Saranac Lake, NY 12983; phone: 518-891-4190. Note: Due to expected inclement weather, the public meeting originally scheduled for March 13, 2018 has been cancelled. A new meeting date and time will be announced in the coming days. The public comment period also will be extended accordingly. DEC invites the public to comment about a proposal for no further action for the B. Millens Scrapyard Site (Kingston, Ulster Co.), within New York's State Superfund Program. Public comments about the proposal will be accepted through March 14, 2018. A public meeting also will be held: February 28, 2018 at 6:00 PM at Kingston Library, 55 Franklin St., Kingston, NY 12401. Staff from DEC, the United States Geological Survey, and the U.S. Fish and Wildlife Service will make a number of presentations, including updates on the status of trout and salmon fisheries in the lake and its tributaries, forage fish, and stocking programs. The meetings will provide ample time at the end of the scheduled program for the audience to interact with the presenters. Information about DEC's Lake Ontario fisheries assessment programs can be found on DEC's website. The meeting is co-hosted by Niagara County Cooperative Extension and the Niagara County Sportfishery Development Board. DEC invites the public to the meeting to learn about a proposed remedy to address contamination related to the Qualitrol Company LLC Site (Fairport, Monroe Co.), within New York's Brownfield Cleanup Program. Public comments also are welcome at the meeting, and during a public comment period that runs through April 16, 2018. Project documents can be reviewed at: Fairport Public Library, 1 Fairport Village Landing, Fairport, NY 14450; phone: 585-223-9091. Public meeting location: Plattsburgh City Hall, 41 City Hall Place, Plattsburgh, NY 12901. DEC invites the public to the meeting to learn about a proposed remedy to address contamination related to the NYSEG-Plattsburg Saranac St. Manufactured Gas Plant (MGP) Site (Plattsburgh, Clinton Co.), within New York's State Superfund Program. Public comments also are welcome at the meeting, and during a public comment period that runs through March 30, 2018. Project documents can be reviewed at: Plattsburgh Public Library, 19 Oak Street, Plattsburgh, NY 12901-2810; phone: 518-563-0921. Public meeting location: Village Hall, 130 Samsondale Avenue, West Haverstraw, NY. DEC invites the public to the meeting to learn about a proposed remedy to address contamination related to the Temco Uniforms Site (West Haverstraw, Rockland Co.), within New York's State Superfund Program. Public comments also are welcome at the meeting, and during a public comment period that runs through March 30, 2018. Project documents can be reviewed at: Haverstraw Library, Attn: Reference Desk, 85 Main Street, Haverstraw, NY; phone: 845-429-3445 --and-- Village Hall and Community Center, 130 Samsondale Avenue, West Haverstraw, NY; phone: 845-947-2800. DEC has received a Brownfield Cleanup Program (BCP) application and Draft Remedial Action Work Plan for a site known as 147-07 94th Avenue, site ID #C241206. This site is located in the Borough of Queens, within the County of Queens, and is located at 147-07 94th Avenue. Comments about the application and draft work plan must be submitted no later than March 17, 2018. A copy of the application, Draft Remedial Action Work Plan, and other relevant documents are available at: Queens Borough Public Library - Central Library, 89-11 Merrick Boulevard, Jamaica, NY 11432 --and-- Queens Community Board District 12, 90-28 161st Street, Jamaica, 11432. Make your home clean and green this St. Patrick’s Day at this interactive workshop. Create simple natural cleaning and beauty products, better than a pot o’ gold. No shenanigans here, but there will be lots of resources shared to help you keep toxins out of your home. Materials fee $10; $8 Friends of Reinstein members. Registration required; call 716-683-5959 to sign up. DEC invites the public to comment about the proposed deletion of the Greer Toyota Site (Wappingers Falls, Dutchess Co.) from New York's Registry of Inactive Hazardous Waste Disposal Sites (State Superfund Registry). DEC has determined that this site no longer presents a threat to public health or the environment. Public comments about the proposal will be accepted through March 18, 2018. Click the web link above at "Additional Information" to learn about the proposal and how to comment. DEC invites the public to comment about a proposed remedy to address contamination related to the 18-46 Decatur Street Site (Ridgewood, Queens), within New York's Brownfield Cleanup Program. Public comments about the proposal will be accepted through March 19, 2018. Project documents can be reviewed at: Queens Library at Ridgewood, 20-12 Madison Street, Ridgewood, NY 11385; phone: 718-821-4770 --and-- Queens Community Board #5, 61-23 Myrtle Ave., Glendale, NY 11385; phone: 718-366-1834. DEC invites the public to comment about a proposal to address contamination related to the Al Tech Specialty Steel Site (Watervliet, Albany Co.), within New York's State Superfund Program. Public comments will be accepted through March 19, 2018. A public meeting also will be held: February 26, 2018 at 7:00PM at the Watervliet Senior Center, 1501 Broadway, Watervliet, NY 12189. DEC invites the public to comment about a proposed remedy to address contamination related to the Undeveloped Portion-Former Abex Mfg. Facility (Medina, Orleans Co.), within New York's Environmental Restoration Program. Public comments about the proposal will be accepted through March 19, 2018. A public meeting about the proposal also will be held: February 21, 2018 at 6:30 PM at Ridgeway Town Hall, 401 West Avenue, Medina, NY 14103. To learn about the proposal, the public meeting, and how to comment, click the web link above at "Additional Information". Project documents can be reviewed at: Lee Whedon Public Library, 620 West Avenue, Medina, NY 14103; phone: 585-798-3430. Mark Lowery will describe anticipated effects of climate change, the level of greenhouse gas emissions reductions needed to avoid the worst effects of climate change, and New York State programs to reduce greenhouse emissions and adapt to unavoidable effects of climate change. The program will include a description of the state’s Climate Smart Communities program, which supports local climate action, and ways for individuals to be involved in the program. Public Meeting Location: P.S. 5 Robert McNair School - 820 Hancock St., Brooklyn, NY 11233. DEC invites the public to the meeting to learn about a no action remedy being proposed for the 192 Ralph Ave. Off-Site (Brooklyn), within New York's State Superfund Program. Public comments also are welcome at the meeting, and during a public comment period that runs through March 28, 2018. Click the web link above to learn about the proposal, the meeting, and how to comment. Project documents can be reviewed at: Saratoga Library, 8 Thomas S. Boyland St., Brooklyn, NY 11233; phone: 718-573-5224. DEC invites the public to the meeting to learn about a proposed remedy to address contamination related to the NFG-Hornell Manufactured Gas Plant (MGP) Site (Hornell, Steuben Co.), within New York's MGP Program. Public comments also are welcome at the meeting, and during a public comment period that runs through March 30, 2018. Project documents can be reviewed at: Hornell Public Library, 64 Genesee Street, Hornell, NY 14843; phone: 607-324-1210. DEC invites the public to the meeting to learn about a proposed remedy to address contamination related to the Industrial Overall Service Corp. Site (New Rochelle), within New York's State Superfund Program. Public comments also are welcome at the meeting, and during a public comment period that runs through March 29, 2018. Click the web link above to learn about the proposal, the public meeting, and how to comment. Project documents can be reviewed at: New Rochelle Public Library, 1 Library Plaza, New Rochelle, NY 10801; phone: 914-632-7878. Experience nature at your own pace, and enjoy a leisurely guided walk through the woods. Bring a lunch if you want to eat indoors after the tour. For adults only. Registration required; call 716-683-5959 to sign up. DEC invites the public to comment about a proposed remedy to address contamination related to the Ekonol Polyester Resins Site (Wheatfield, Niagara Co.), within New York's Voluntary Cleanup Program. Public comments about the proposal will be accepted through March 22, 2018. Project documents can be reviewed at: NYSDEC, Attn: Glenn May, 270 Michigan Ave., Buffalo, NY 14203; phone: 716-861-7220. DEC invites the public to the meeting to learn about a remedy being proposed to address contamination related to the Staubs Textile Services, Inc. Site (Rochester, Monroe Co.), within New York's State Superfund Program. Public comments also are welcome at the meeting, and during a public comment period that runs through March 30, 2018. Project documents can be reviewed at: Monroe County Library System, Monroe Branch Library, 809 Monroe Avenue, Rochester, NY 14607; phone: 585-428-8202. DEC has received a Brownfield Cleanup Program (BCP) application for a site known as Former Majestic Garment Cleaners, site ID #C224035. This site is located in the Borough of Brooklyn, within the County of Kings, and is located at 740 Pine Street. Comments about the application must be submitted no later than March 23, 2018. A copy of the application and other relevant documents are available at: Cypress Hills Library, 1197 Sutter Avenue, Brooklyn 11208 --and-- Brooklyn Community Board 5, 404 Pine Street, 3rd Fl, Brooklyn 11207. DEC invites the public to comment about a proposed remedy to address contamination related to the American Cleaners Site (Middletown, Orange Co.), within New York's Voluntary Cleanup Program. Public comments about the proposal will be accepted through March 23, 2018. Project documents can be reviewed at: Middletown Thrall Library, 11-19 Depot Street, Middletown, NY 10940; phone: 845-341-5461. DEC invites the public to comment about a proposal for no further action related to the National Plating Company, Inc. Site (Syracuse, Onondaga Co.), within New York's Voluntary Cleanup Program. Public comments about the proposal will be accepted through March 24, 2018. Project documents can be reviewed at: NYSDEC, Attn: Michael Belveg, 615 Erie Blvd. West, Syracuse, NY 13204; phone: 315-426-7551. Stop by DEC's booth for information on Bridle trails. Put a spring in your step as we look for signs of the new season. Registration required; call 716-683-5959 to sign up. What bird am I? Come learn the general types of birds found in Reinstein Woods. For adults and children ages 8 and older. Registration required; call 716-683-5959 to sign up. DEC invites the public to comment about a proposal for no further action related to the Former Ogilvie Foods Company Site (Watertown, Jefferson Co.), within New York's Brownfields Cleanup Program. Public comments about the proposal will be accepted through March 26, 2018. 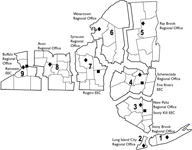 Project documents can be reviewed at: City Hall, 245 Washington Avenue, Watertown, NY 13601; phone: 315-785-7730. DEC invites the public to comment about a proposed remedy to address contamination at a portion of the Former IBM Endicott Facility (Endicott, Broome Co.), within New York's State Superfund Program. Public comments about the proposal will be accepted through March 26, 2018. A public meeting also will be held: March 8, 2018 at 6:00 PM at Union-Endicott High School, Lecture Hall, 1200 East Main St., Endicott, NY 13760. Project documents can be reviewed at: George F. Johnson Memorial Library, Attn: Reference Librarian, 1001 Park St., Endicott, NY 13760; phone: 607-757-5350. DEC invites the public to comment about a proposal to address contamination related to the Noss Industrial Park Site (Cortland, Cortland Co.), within New York's Environmental Restoration Program. Public comments about the proposal will be accepted through March 26, 2018. A public meeting also will be held about the proposal: March 7, 2018 at 6:00 PM at City Hall, 25 Court Street, 3rd Floor Conference Room, Cortland, NY 13045. Project documents can be reviewed at: Cortland Free Library, Attn: Periodicals Room, 32 Church Street, Cortland, NY 13405; phone: 607-753-1042. Data integrity is fundamental to any water monitoring project so that the data can be used with confidence. This DEC webinar will focus on two critical elements that support data integrity: quality assurance and the NYS Department of Health (DOH) Environmental Laboratory Approval Program (ELAP). To view the webinar, visit the above link at the webinar start time. Pre-registration is not required. DEC invites property owners and residents to attend one of two availability sessions (3:00 PM - 5:00 PM or 6:00 PM - 8:00 PM) to discuss the continuation of cleanup of properties in neighborhoods adjacent to the Former Geneva Foundry Site (Geneva, Ontario Co.). Representatives from DEC and the New York State Department of Health will be on hand to discuss the upcoming activities. Click the web link above at "Additional Information" to learn about the upcoming continued cleanup and the availability sessions. Project documents are available for review at: Geneva Public Library, 244 Main Street, Geneva, NY 14456; phone: 315-789-5303. NYSDEC Division of Marine Resources will be hosting a public meeting regarding the proposed 2018 New York Recreational Black Sea Bass Regulations. The meeting will take place at The School of Marine and Atmospheric Sciences (SoMAS), SUNY Stony Brook, in Endeavor Hall, Room 120. Directions to SoMAS: Long Island Expressway (LIE, I-495) to exit 62 (Nicolls Road/County Route 97). North on Nicolls Road for about 9 miles, crossing Route 347 to 2nd traffic light north of 347. Make a left at light (South Entrance) onto South Drive. At the next light, make a right turn onto Marburger Drive. Less than 500' turn right into Marine Sciences entrance, and immediately bear right. Follow the road to the School of Marine & Atmospheric Sciences and Endeavour Hall. Anglers and other interested groups are encouraged to attend and provide input regarding the proposed recreational regulations. Input gathered at this meeting will be considered by NYSDEC Marine Resources and New York’s Marine Resource Advisory Council when setting regulations for 2018. DEC invites the public to comment about a proposal for no action related to the off-site investigation of the 192 Ralph Ave. Site (Brooklyn), within New York's State Superfund Program. Public comments about the proposal will be accepted through March 28, 2018. A public meeting also will be held: March 20, 2018 at 7:00 PM at P.S. 5 Robert McNair School - 820 Hancock St., Brooklyn, NY 11233. Project documents are available for review at: Saratoga Library, 8 Thomas S. Boyland St., Brooklyn, NY 11233; phone: 718-573-5224. DEC invites the public to comment about a proposed remedy to address contamination related to the Industrial Overall Service Corp. Site (New Rochelle, Westchester Co.) within New York's State Superfund Program. Public comments about the proposal will be accepted through March 29, 2018. A public meeting about the proposal also will be held: March 13, 2018 at 7:00 PM at New Rochelle Public Library, 1 Library Plaza, New Rochelle, NY. The Salmon River Fish Hatchery is located on County Route 22, one mile northeast of the Village of Altmar, Oswego County. DEC has received a Brownfield Cleanup Program (BCP) application and Draft Remedial Investigation Work Plan for a site known as 546 Locust Street, site ID #C360162. This site is located in the City of Mount Vernon, within the County of Westchester, and is located at 546 Locust Street. Comments about the application and work plan must be submitted no later than March 30, 2018. A copy of the application, Draft Remedial Investigation Work Plan and other relevant documents are available at: Mount Vernon Public Library, 28 South First Street, Mount Vernon 10050. DEC invites the public to comment about a proposed remedy to address contamination related to the NYSEG - Plattsburg Saranac St. Manufactured Gas Plant Site (Plattsburgh, Clinton Co.), within New York's State Superfund Program. Public comments about the proposal will be accepted through March 30, 2018. A public meeting also will be held: March 14, 2018 at 7:00 PM at Plattsburgh City Hall, 41 City Hall Place, Plattsburgh, NY 12901. DEC invites the public to comment about a proposed remedy to address contamination related to the CE-W. 42nd St. Gas Works Site (Manhattan), within New York's Voluntary Cleanup Program. Public comments about the proposal will be accepted through March 30, 2018. Project documents can be reviewed at: Manhattan Borough President, Attn: Gail Brewer, 1 Centre St., 19th Floor, New York, NY 10007; phone: 212-669-8300 --and-- Manhattan Community Board 4, Attn: Jesse Bodine, 330 W. 42nd St., Suite 2618, New York, NY 10036; phone: 212-736-4536 --and-- Columbus Library, 742 10th Avenue, New York, NY 10019; phone: 212-586-5098. DEC invites the public to comment about a proposed remedy to address contamination related to the Federal-Mogul/Huck Site (Kingston, Ulster Co.), within New York's Voluntary Cleanup Program. Public comments about the proposal will be accepted through March 30, 2018. Project documents can be reviewed at: Kingston Library, Attn: Margie Menard, 55 Franklin St., Kinston, NY 12401-0507; phone: 845-331-0507. DEC invites the public to comment about a proposed remedy to address contamination related to the GTE Products Corporation (Seneca Falls, Seneca Co.), within New York's Resource Conservation and Recovery Act Corrective Action Program. Public comments about the proposal will be accepted through March 30, 2018. Click the web link above at "Additional Information" to learn about the facility, the proposed remedy, and how to comment. Project documents can be reviewed at: Seneca Falls Public Library, 47 Cayuga Street, Seneca Falls, NY 13148; phone: 315-568-8265. DEC invites the public to comment about a proposed remedy to address contamination related to the NFG - Hornell (Manufactured Gas Plant (MGP) Site (Hornell, Steuben Co.), within New York's MGP Program. Public comments about the proposal will be accepted through March 30, 2018. A public meeting also will be held: March 20, 2018 at 7:00 PM at VFW Post 2250, 245 Canisteo Street, Hornell, NY 14843. DEC invites the public to comment about a proposed remedy to address contamination related to the Staubs Textile Services, Inc. Site (Rochester, Monroe Co.), within New York's State Superfund Program. Public comments about the proposal will be accepted through March 30, 2018. A public meeting also will be held: March 22, 2018 at 6:30 PM at Rochester City Hall, 30 Church St., Room 208A, Rochester, NY. DEC invites the public to comment about a proposed remedy to address contamination related to the Temco Uniforms Site (West Haverstraw, Rockland Co.), within New York's State Superfund Program. Public comments about the proposal will be accepted through March 30, 2018. A public meeting also will be held: March 15, 2018 at 7:00 PM at Village Hall, 130 Samsondale Avenue, West Haverstraw, NY. Learn the initial set up of worm composting for indoors and/or outdoors. Cost for starter kit is $4.00, Friends members $2.00. Please call to register for all three classes. (May 12 - Class #2, June 30 - Class #3). Registration required; call 716-683-5959 to sign up. Plants and animals are preparing for the season of rebirth. It may seem as though it is too early to sense these signs but, they are all around us. Join us for this mile-long walk on relatively flat terrain to look and listen for these early indicators of life returning to the landscape.